Service Company. Mr. Peters brings extensive sales and engineering experience to the top post, with over 25 years within the marine electronics field, 10 of these with Raytheon Marine Com- pany. Prior to his most recent position as manag- ing director he was Raytheon's marketing man- ager for North American operations. PC-TRAP, is user friendly, can replace hand written logs and can transmit information to shore side offices. PC-TRAP uses pre-formatted forms, and the menu driven program includes deck log informa- tion, crew log information, tow diagrams (barge arrangements), pickup/drop-off7exchange orders, fuel logs, phone directory and electronic mailbox messaging. In addition, the program can be customized for other forms as required by the user. Watercom telephone system. Transmissions are easy-to-read and can also be printed out on board. PC-TRAP joins Watercom's other communica- tions services and products which include Auto- mated Vessel Tracking System (ATVS). ATVS is a service which automatically pinpoints boat or fleet locations anywhere along the 4,000 miles of waterways Watercom serves. In addition, the company's one-of-a-kind, direct-dial telephone system offers voice service, data transmission, facsimile capabilities, credit card calling for crew members, low nighttime rates and other benefits to companies doing business on America's rivers. Henry Clark Ltd. since 1985, was recently ap- pointed director (marine) for the Jotun Protec- tive Coatings Group and is now also responsible for the marketing of Jotun marine coatings world- wide. Jotun-Henry Clark in 1976 as an executive sales manager, and later served the Jotun group both in the USA and Singapore as managing director of Jotun NOF (Pte) Ltd.
Jotun has become synonymous with high qual- ity in products, people and service. 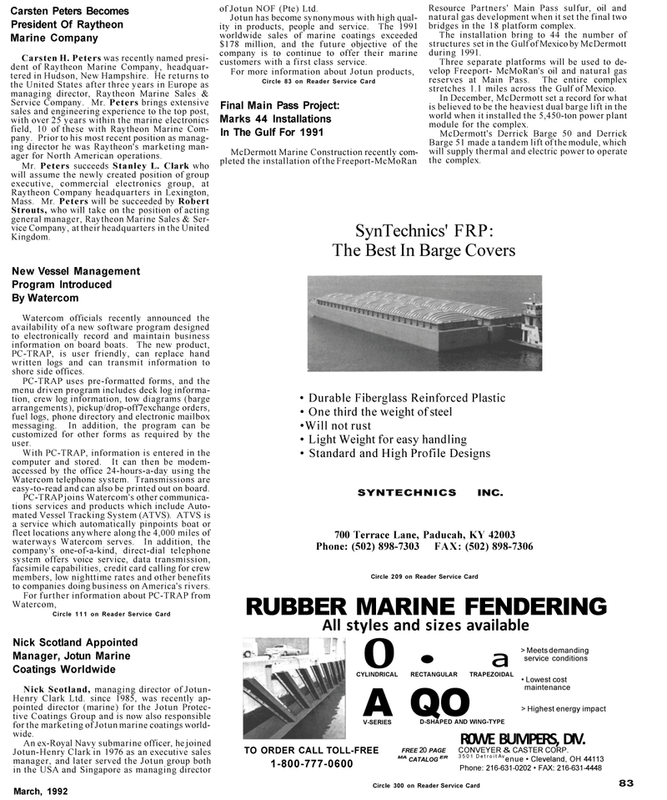 The 1991 worldwide sales of marine coatings exceeded $178 million, and the future objective of the company is to continue to offer their marine customers with a first class service. Resource Partners' Main Pass sulfur, oil and natural gas development when it set the final two bridges in the 18 platform complex. The installation bring to 44 the number of structures set in the Gulf of Mexico by McDermott during 1991. Three separate platforms will be used to de- velop Freeport- McMoRan's oil and natural gas reserves at Main Pass. The entire complex stretches 1.1 miles across the Gulf of Mexico. In December, McDermott set a record for what is believed to be the heaviest dual barge lift in the world when it installed the 5,450-ton power plant module for the complex. Barge 51 made a tandem lift of the module, which will supply thermal and electric power to operate the complex. FREE 20 PAGE CONVEYER & CASTER CORP.